At the start of the second half in the capital, the Eagles are up 45-14. Here's your belated open thread. Michael Vick, who is 30, earned $1.2 million last season and picked up a second-year option of $5.2 million last spring. Tonight, he's so far thrown 14-for-18 for 264 yards, three touchdowns, and zero interceptions. 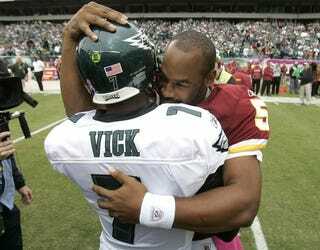 His friend and former teammate Donovan McNabb, who turns 34 next week, agreed today to a 5-year, $78-million contract ($40 million guaranteed) with the Washington Redskins. Two quarters in, Donovan is 9-for-16 for 206 yards. He's thrown two touchdowns and two interceptions. Not the greatest discrepancy, sure — but perhaps a bit of a red flag for the Philadelphia front office, which reportedly has not yet discussed a contract extension with its starting QB.